1. Add all 3 teabags to 500ml boiling water and set aside to infuse for 3 miuntes, then remove the teabags. 2. 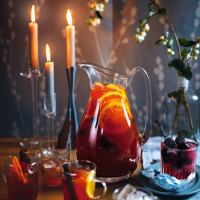 In a pitcher, mix together the vodka, the limocello, the lemon juice, the warm spice syrup (you can infuse Vedrenne Vanilla Syrup with cinnamon, cloves, cardomom and nutmeg) and then add the tea. Stir well. 3. To garnish, use a sharp knife to cut thick lemon, orange and grapefruit slices. Add to the pitcher with cinnamon sticks, blackberries, raspberries and cherries. Add ice before serving.